Ashmount School has been awarded the SEN (Special Educational Needs) School or Group of the Year Award at an awards ceremony in London for its continued commitment to developing our pupils’ communication skills. 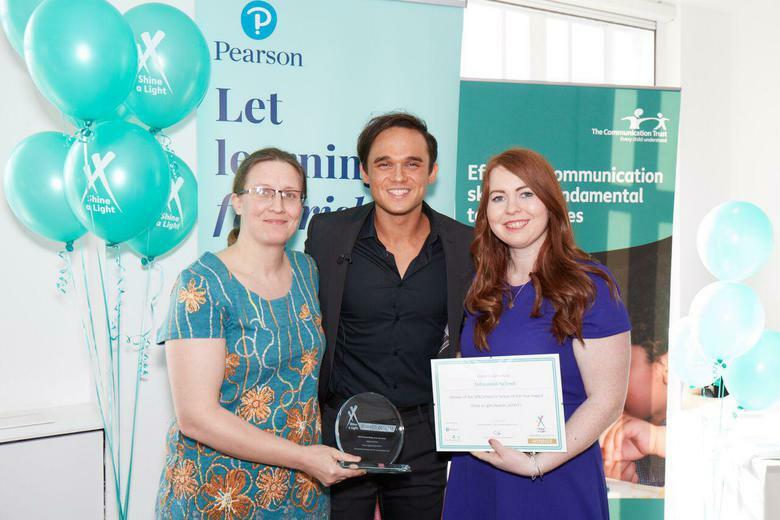 The 2017 Shine a Light Awards, run by Pearson in partnership with The Communication Trust, took place on 23rd March 2017 and were hosted by singer and theatre star Gareth Gates. The 2017 Shine a Light Awards is a national awards scheme that celebrates innovative work and excellent practice in supporting children and young people’s communication development. Ashmount School was praised for having shown strong commitment to developing pupils’ communication skills to ensure that they are empowered to meaningfully input into decisions affecting their own lives as they grow up and mature. The school has also become a Speech and Language Therapy hub for the East Midlands and coordinates a wide range of language groups, providing support and training for parents, caregivers and staff in local schools. The school has created a communication team that delivers efficient, coordinated support. We have created 16 language groups involving pupils who use VOCA (Voice Output Communication Aids), Eye Gaze, Makaton (sign language) and spoken language and have developed an assessment toolkit as well as a switch/AAC (Augmentative and Alternative Communication) assessment library for use by parents and partner schools. Gareth Gates, host of the 2016/17 Shine a Light Awards, said: “The dedication of Ashmount School is outstanding. Being able to communicate with confidence is often taken for granted but for many it is an everyday struggle. I have found my stutter crippling at times but I have learnt ways to manage my difficulties with the support of others. Chris Hall, Director of Clinical Assessment at Pearson, said: “Congratulations to Ashmount School for their SEN School or Group of the Year achievement. The dedication to improving its pupils’ abilities is amazing; the innovative use of language groups and reaching out to their local area means the school is empowering so many children and young adults."